It’s been raining non-stop. Figuratively and literally. 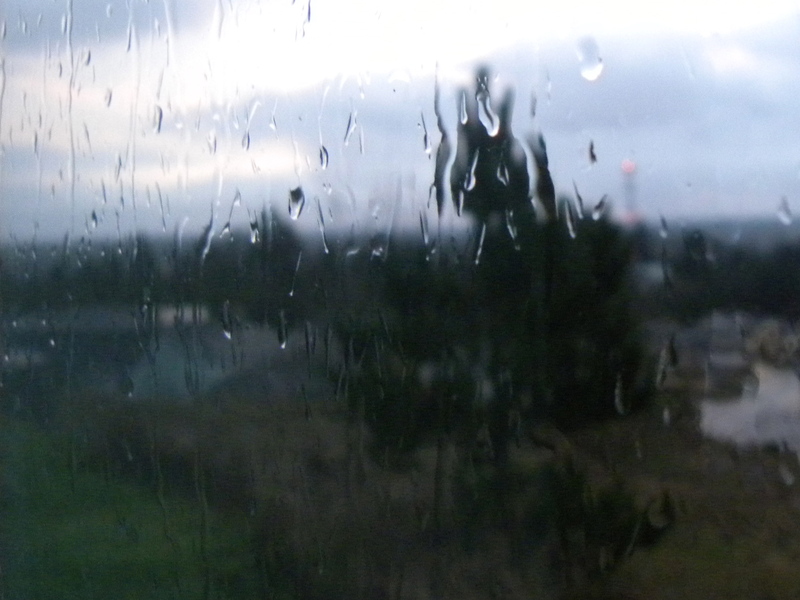 Sometimes it’s a light mist, sometimes it’s a steady rain and other times it’s been a raging storm. There were moments when I thought the house, high atop the hill, was going to fall to pieces, the rain pounding down on it until there is nothing left. It’s why people here in the Pacific Northwest drink so much coffee. And why I am drawn to such saturated colors. So that I won’t get washed out. Miraculously, it stopped raining this morning. The cloudy skies are still ominous with a constant threat of rain. But right now, this very second, no rain falls. I don’t know what to do with myself. I don’t really want to go outside – it’s still a mess. Mud and puddles – evidence of the rain is everywhere. But the smell of the land after the rain, after everything has been washed away, is magnificent. Purity in the most amazing form. It might be enough to draw me out. I remember being a little girl and trying to sleep the night before Christmas. Lying in bed, eyes wide open, my whole body trembling with anticipation for Christmas morning and what treasures I might find. Sleep was nearly impossible. Here it is, 2:30 in morning on December 25th, and sleep is impossible. But not out of anticipation, but from dread. Because every time I awake there is confusion, a hazy transition between dream and reality and then the moment when I come to my senses and realize my life is no longer what it was. I learned long ago not to lose myself into a relationship. A lesson learned the hard way, and one I was determined never to repeat. And I am proud to say that I haven’t. I am my own person with my own values, friends, opinions and interests that didn’t get lost when I partnered up. So this loss is different than before, when I had to rediscover myself and figure out who I am. I know who I am and that hasn’t changed. But when you decide to be with somebody, when you share with them the core of your being, you grow beyond yourself. Life becomes bigger. That person becomes the most important and significant being in your life. And to lose that, the person and the partnership is devastating. I didn’t lose me, I lost the person I chose to be with. The person that I had made a life with over the years. What’s the best way to mourn a relationship? One minute I am so desperately sad for the loss of us. No more shared looks, no more knowing that person as well as you know yourself, no more future plans. What do you do with that shared history? That time spent together? Of being happy? Do you cherish it? Lock it away and don’t revisit it until your heart is healed and it is no more than a ghost? Or do you crush it? Poison all of it with the hurt and anger such that it ceases to have ever existed? Think only about all of the lows, the frustrations of the relationship, of how it ended. I want to do that so badly. To tear down everything that we had together, to turn my compromises into sacrifices and make him the villain of my life. But how do I live with my choice? I spent years with him; we were good together and have a lot of happy memories. As well as some unhappy ones. All relationships do. Which ones will win? Will I become the sad, desperate girl who never gets over lost love? Or will I become the hard, cynical spinster who will never let herself love again? And at the same time feel all too human. The pain and the hurt are overwhelming. I am not a nice person to be around right now. I spent the last two days in a car with my mother and two cats, driving seventeen hundred miles through four states so that I could be surrounded by family. The drive was uncomfortable. Silent and awkward. Too many thoughts and the emptiness of the landscape. My mother stuck, for there are no words of comfort in a time like this. And still, knowing that, I acted like a sullen teenager. I am avoiding my friends, the people who are desperate to help me through this. I can’t bear the thought of sharing my misery. And it’s especially difficult, given how scattered everybody is. That long drive in the car emphasized exactly how far away from my loved ones I am. It’s difficult to sit on a couch with a bottle of wine and escape into nothingness in the company of your dearest friends over the phone. Not that each and every one of them haven’t offered to do just that. But the fact is, I don’t have a home at the moment. I don’t have my very own space to curl up in. To avoid reality. To wait out the pain, to let the numbness settle in. The past week is a blur. There was a list a mile long of pesky details that needed to be dealt with. And I unwillingly dealt with them all. And now I am left with the emptiness. The questions. The anger. The doubts. The pain. The loneliness. The love that no longer has a place in this world. It’s a sorry state to be in. I don’t like being here. I hate that I am dragging others into it, especially during this time of year. But I can’t pull myself out of it. I don’t have it in me just yet. The emptiness abounds. For now. This was not the post I was expecting to write. I am supposed to be sitting in a moving van with all of my worldly belongings and the love of my life driving South towards a life that I had so desperately yearned for. But just a few short days ago, after all of the plans had been made, I was asked not to move to Florida. It feels as though my entire world has crumbled down around me. Now, my collection of possessions are sitting just blocks from my soon-to-be vacated apartment. I am heartbroken, homeless and lost of all hope. Long-distance got the best of this long-distance relationship. It’s a dark place to be. And I am taking this blog to the heart of the darkness. I’ve lost my appetite, so don’t expect any light-hearted recipes and cute stories from my childhood in the near future. I thought about not writing about this; to keep it all to myself. It’s not about the boy and what happened. It’s about searching myself and finding a way. Writing therapy, if you will. To make it public will keep things in perspective; to be fair to all parties involved. Healing takes time and space. So instead of heading South with the person I built a life with, I am heading West for a while with my constant companions, Puck and Kudzu, to lick my wound in the welcoming, supportive and loving arms of my family. And to surround myself in the grey mist of the Pacific Northwest. A gloominess that mirrors that in my heart and mind. In my heart, I know that there is majesty and beauty and sheer awesomeness beneath it all. I just don’t know when the sun will come out from behind the clouds. Which means it’s time for breakfast awesomeness. Cereal and toast on a Saturday morning may just be the saddest thing ever. Perhaps I am being melodramatic, but I take weekend breakfast (or more often, brunch) very seriously. We are in the stretch between Thanksgiving and Christmas and these Spiced Pumpkin Pancakes fit in just about perfectly. The pumpkin flavor is subtle, but keeps the pancakes uber-moist. 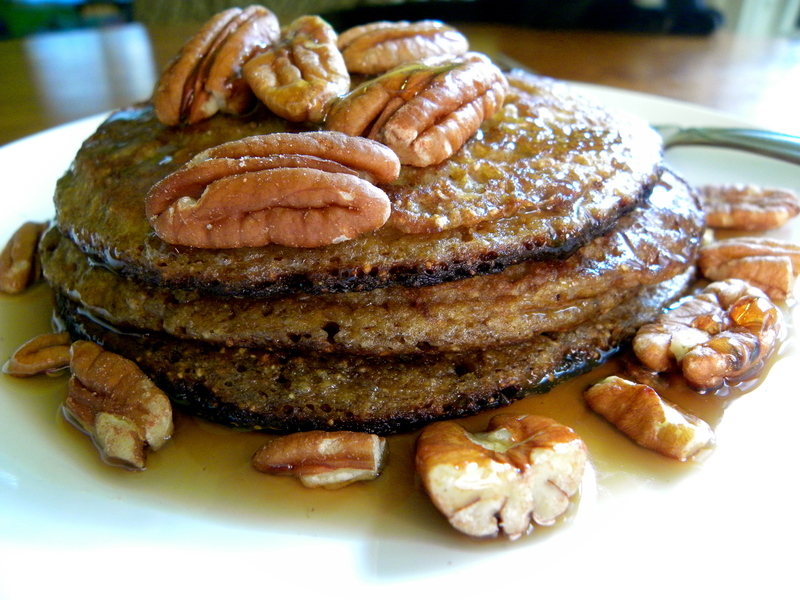 Add some pecans and maple syrup and you have something special. A perfect start to a day filled with tree decorating or shopping for the perfect gift. Whisk both flours, sugar, baking powder, cinnamon, nutmeg, ginger, allspice and salt together in a large bowl. In a separate bowl, whisk milk, pumpkin puree, egg yolks, melted butter and vanilla. Add pumpkin mixture to the dry ingredients and whisk until smooth. Beat egg whites until stiff (but not dry); fold into pancake batter in two batches. Heat a skillet over medium heat and melt a tablespoon of butter. Pour batter by 1/3 cupfuls into the skillet. 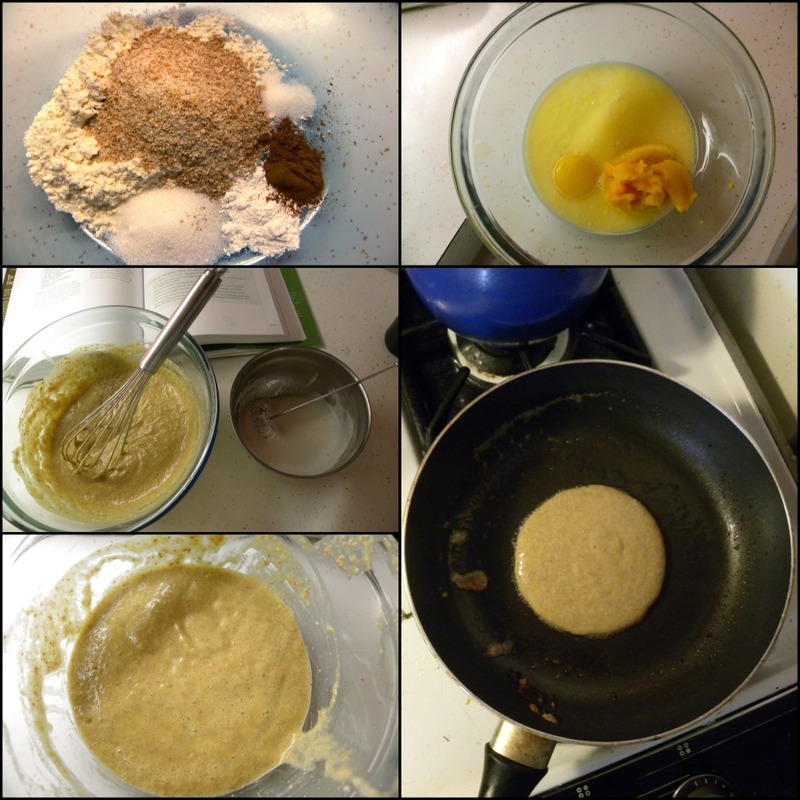 Cook until bubbles form on the surface of the pancakes and the bottoms are brown. Flip and cook for a minute or two longer. 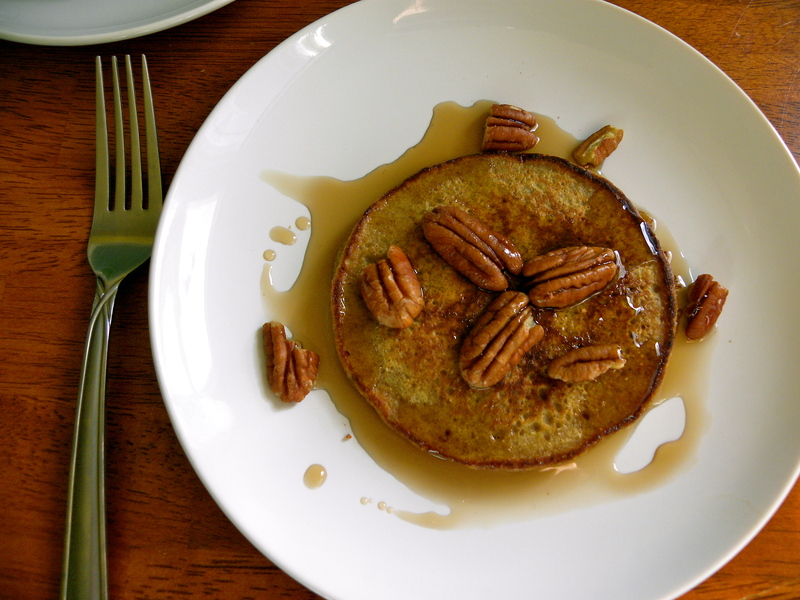 Serve with toasted pecans and maples syrup.